Łódź (Polish: [wutɕ] ( listen); also written in English as Lodz)[a] is the third-largest city in Poland and a former industrial hub. Located in the central part of the country, it has a population of 687,702 (2018). 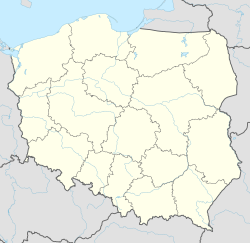 It is the capital of Łódź Voivodeship, and is approximately 120 kilometres (75 mi) south-west of Warsaw. The city's coat of arms is an example of canting, as it depicts a boat (łódź), which alludes to the city's name. After Poland regained its independence in 1918, Łódź grew to be one of the largest Polish cities and one of the most multicultural and industrial centers in Europe. The interbellum period saw rapid development in education and healthcare. After the invasion of Poland in 1939, the German Army captured the city and renamed it Litzmannstadt in honour of the German general Karl Litzmann, who was victorious near the area during World War I. The city's large Jewish population was forced into a walled zone known as the Łódź Ghetto, from which they were sent to German concentration and extermination camps. Following the occupation of the city by the Soviet Army, Łódź, which sustained insignificant damage during the war, became part of the newly established Polish People's Republic. Despite the air of impending crisis preceding World War I, the city grew constantly until 1914. By that year it had become one of the most densely populated as well as one of the most polluted industrial cities in the world—13,280 inhabitants per square kilometre (34,400/sq mi). A major battle was fought near the city in late 1914, and as a result the city came under German occupation after 6 December but with Polish independence restored in November 1918 the local population liberated the city and disarmed the German troops. In the aftermath of World War I, Łódź lost approximately 40% of its inhabitants, mostly owing to draft, diseases, pollution and primarily because of the mass expulsion of the city's German population back to Germany. The Nazi authorities soon established the Łódź Ghetto (Ghetto Litzmannstadt) in the city and populated it with more than 200,000 Jews from the Łódź area. As Jews were deported from Litzmannstadt for extermination, others were brought in. Several concentration camps and death camps arose in the city's vicinity for the non-Jewish inhabitants of the regions, among them the infamous Radogoszcz prison and several minor camps for the Romani people and for Polish children. Due to the value of the goods that the ghetto population produced for the German military and various civilian contractors, it was the last major ghetto to be liquidated, in August 1944. While occupied, thousands of new ethnic German Volksdeutsche came to Łódź from all across Europe, many of whom were repatriated from Russia during the time of Hitler's alliance with the Soviet Union before Operation Barbarossa. In January 1945, most of the German population fled the city for fear of the Red Army. The city also suffered tremendous losses due to the German policy of requisition of all factories and machines and transporting them to Germany. Thus, despite relatively small losses due to fighting and aerial bombardment, Łódź was deprived of most of its industrial infrastructure. The Soviet Red Army entered the city on 18 January 1945. According to Marshal Katukov, whose forces participated in the operation, the Germans retreated so suddenly that they had no time to evacuate or destroy any of the factories, as they had in other cities. Łódź subsequently became part of the Polish People's Republic. Under the Polish Communist regime many of the rich industrialist and business magnate families lost their wealth when the authorities nationalised private companies. Once again the city became a major centre of industry. A number of extensive panel block housing estates (including Retkinia, Teofilów, Widzew, Radogoszcz and Chojny) were constructed between 1960 and 1990, covering an area of almost 30 square kilometres (12 sq mi) and accommodating a large part of the city's population. In mid-1981 Łódź became famous for its massive hunger demonstration of local mothers and their children. In 1988 the population of the city peaked to 854,261, gradually dropping ever since. After the period of economic transition during the 1990s, most enterprises were again privatised. Łódź was Poland's second largest city until 2007, when it lost its position to Kraków. This is because alongside the entire region of Łódź Voivodeship, the city is experiencing substantial population decline. Since the population peak of 1988, when the number of inhabitants reached 854,261, Łódź has lost more than 150,000 residents. Such a dramatic change results mainly from low fertility rates and low life expectancy on the one hand, and a negative migration balance on the other. A major factor behind the shrinkage of the city was the transition from socialist to market-based economy after 1989 and the resulting economic crisis, but the economic growth following Poland's accession to the European Union in 2004 has not reversed the trend. The process of suburbanization also contributes to it, with a number of non-urban areas in counties surrounding Łódź steadily increasing in population. While the 'fringe area' around Łódź is expected to register an insignificant growth of less than 2,000 people until 2050, the population of the city proper by the middle of the 21st century is estimated to drop below the level of 500,000. The ongoing ageing and depopulation of Łódź is a major challenge for the future development of the city, putting strain on social infrastructure and medical services. Łódź has one of the highest feminization rates among Poland's major cities, a legacy of the city's industrial past, when the textile factories attracted large numbers of female employees. The rising age of the population, coupled with a longer life expectancy among women, further exacerbates the disproportion. The most notable and recognizable landmark of the city is Piotrkowska Street, which remains the high-street and main tourist attraction in the city, runs north to south for a little over five kilometres (3.1 miles). This makes it one of the longest commercial streets in the world. Most of the building façades, many of which date back to the 19th century, have been renovated. It is the site of most restaurants, bars and cafes in Łódź's city centre. Many neglected tenement houses throughout the entire city centre have been renovated in recent years as part of the ongoing revitalization project run by the local authorities. The best example of urban regeneration in Łódź is the Manufaktura complex, occupying a large area of a former cotton factory dating back to the nineteenth century. The site, which was the heart of Izrael Poznański's industrial empire, now hosts a shopping mall, numerous restaurants, 4-star hotel, multiplex cinema, factory museum, bowling and fitness facilities and a science exhibition centre. Opened in 2006, it quickly became a centre of cultural entertainment and shopping, as well as a recognizable city landmark attracting both domestic and foreign tourists. The city is also likely to receive a large boost in terms of tourism once the massive revitalization project of the city's downtown (worth 4 billion PLN) is completed. The local government's efforts to transform the former industrial city into a thriving urban environment and tourist destination formed the basis for the city's failed bid to organise the 2022 International EXPO exhibition on the subject of urban renewal. Łódź has one of the best museums of modern art in Poland. Muzeum Sztuki has three branches, two of which (ms1 and ms2) display collections of 20th and 21st century art. The newest addition to the museum, ms2 was opened in 2008 in the Manufaktura complex. The unique collection of the Museum is presented in an unconventional way: instead of a chronological lecture on the development of art, works of art representing various periods and movements are arranged into a story touching themes and motifs important for the contemporary public. The third branch of Muzeum Sztuki, located in one of the city's many industrial palaces, also has more traditional art on display, presenting works by European and Polish masters such as Stanisław Wyspiański and Henryk Rodakowski. Among the 14 registered museums to be found in Łódź, there is the independent Book Art Museum, awarded the American Printing History Association's Institutional Award for 2015 for its outstanding contribution to the study, recording, preservation and dissemination of printing history in Poland over the last 35 years. Other notable museums include the Central Museum of Textiles with its open-air display of wooden architecture, the Cinematography Museum, located in Scheibler Palace, and the Museum of Independence Traditions, occupying the building of a historical Tsarist prison from the late 19th century. A more unusual establishment, the Dętka museum offers tourists a chance to visit the municipal sewer designed in the early years of the 20th century by the British engineer William Heerlein Lindley. Łódź also provides plenty of green spaces for recreation. Woodland areas cover 9.61% of the city, with parks taking up an additional 2.37% of the area of Łódź (as of 2014). Las Łagiewnicki (Łagiewnicki Forest), the largest forest within city limits, is referred to in scholarship as "the largest forested area within the administrative borders of any city in Europe." It has an area of 1,245 ha and is cut across by a number of hiking trails that traverse the hilly landscape on the western edge of Łódź Hills Landscape Park. A "natural complex which has remained nearly intact as oak-hornbeam and oak woodland," the forest is also rich in history, and its attractions include a Franciscan friary dating back to the early 18th century and two 17th-century wooden chapels. Out of a total of 44 parks in Łódź (as of 2014), 11 have historical status, the oldest of them dating back to the middle of the 19th century. The largest of these, Józef Piłsudski Park (188,21 ha), is located near the Łódź Zoo and the city's botanical garden, and together with them it comprises an extensive green complex known as Zdrowie serving the recreational needs of the city. The Jewish Cemetery at Bracka Street, one of the largest of its kind in Europe, was established in 1892. After the invasion of Poland by Nazi Germany in 1939, this cemetery became a part of Łódź's eastern territory known as the enclosed Łódź ghetto (Ghetto Field). Between 1940 and 1944, approximately 43,000 burials took place within the grounds of this rounded-up cemetery. In 1956, a monument by Muszko in memory of the victims of the Łódź Ghetto was erected at the cemetery. It features a smooth obelisk, a menorah, and a broken oak tree with leaves stemming from the tree (symbolizing death, especially death at a young age). As of 2014[update] the cemetery has an area of 39.6 hectare. It contains approximately 180,000 graves, approximately 65,000 labelled tombstones, ohels and mausoleums. Many of these monuments have significant architectural value; 100 of these have been declared historical monuments and have been in various stages of restoration. The mausoleum of Izrael and Eleanora Poznanski is perhaps the largest Jewish tombstone in the world and the only one decorated with mosaics. The city benefits from its central location in Poland. A number of firms have located their logistics centres in the vicinity. Two motorways, A1 spanning from the north to the south of Poland, and A2 going from the east to the west, intersect northeast of the city. As of 2012[update], the A2 is complete to Warsaw and the northern section of A1 is largely completed. With these connections, the advantages of the city's central location should increase even further. Work has also begun on upgrading the railway connection with Warsaw, which reduced the 2-hour travel time to make the 137 km (85 mi) journey 1.5 hours in 2009. As of 2018, travel time from Łódź to Warsaw is around 1.2 hours with the modern Pesa SA Dart trains. Recent years have seen many foreign companies opening and establishing their offices in Łódź. The Indian IT company Infosys has one of its centres in the city. In January 2009 Dell announced that it will shift production from its plant in Limerick, Ireland to its plant in Łódź, largely because the labour costs in Poland are a fraction of those in Ireland. The city's investor friendly policies have attracted 980 foreign investors by January 2009. Foreign investment was one of the factors which decreased the unemployment rate in Łódź to 6.5 percent in December 2008, from 20 percent four years earlier. Łódź is situated near the geographical centre of Poland, only a short distance away from the motorway junction in Stryków where the two main north-south (A1) and east-west (A2) Polish transport corridors meet, which positions the city on two of the ten major trans-European routes: from Gdańsk to Žilina and Brno and from Berlin to Moscow via Warsaw. It is also part of the New Silk Road, a regular cargo rail connection with the Chinese city of Chengdu operating since 2013. Łódź is served by the national motorway network, an international airport, and long-distance and regional railways. It is at the centre of a regional and commuter rail network operating from the city's various train stations. Bus and tram services are operated by a municipal public transport company. There are 130 km (81 mi) of bicycle routes throughout the city. Łódź has a number of long distance and local railway stations. There are two main stations in the city, but with no direct rail connection between them—a legacy of 19th-century railway network planning. Originally constructed in 1866, the centrally-located Łódź Fabryczna was a terminus station for a branch line of the Warsaw-Vienna railway, whereas Łódź Kaliska was built more than thirty years later on the central section of the Warsaw-Kalisz railway. For this reason most intercity train traffic goes to this day through Łódź Kaliska station, despite its relative distance from the city centre, and Łódź Fabryczna serves mainly as a terminal station for trains to Warsaw. The situation will be remedied in 2021 after the construction of a tunnel connecting the two, which is likely to make Łódź Poland's main railway hub. The tunnel will additionally serve Łódź Commuter Railway, providing a rapid transit system for the city, dubbed the Łódź Metro by the media and local authorities. Two new stations are to be constructed on the underground line, one serving the needs of the Manufaktura complex and the other located in the area of Piotrkowska Street. The city has experience as a host for international sporting events such as the 2009 EuroBasket, and it will be one of the six host cities of the 2019 FIFA U-20 World Cup, with the opening and final to take place at Stadion Widzewa. Łódź will also host the sixth edition of the European Universities Games in 2022. ^ English: /lɒdz/ LODZ also US: /wuːtʃ, luːdʒ/ WOOCH, LOOJ and UK: /wʊtʃ/ WUUCH. ^ "Łódź" (US) and "Łódź". Oxford Dictionaries. Oxford University Press. Retrieved 16 September 2018. ^ "Lodz". Merriam-Webster Dictionary. Retrieved 16 September 2018. ^ "Łódź". Collins English Dictionary. HarperCollins. Retrieved 16 September 2018. ^ "Łódź". The American Heritage Dictionary of the English Language (5th ed.). Boston: Houghton Mifflin Harcourt. 2014. Retrieved 11 April 2019. ^ "Local Data Bank". Statistics Poland. Retrieved 5 November 2018. Data for territorial unit 1061000. ^ "Łódź - Warszawa trasa i odległość na mapie • dojazd PKP, BUS, PKS". www.trasa.info. Retrieved 2 August 2018. ^ a b "Lodz – Tourism | Tourist Information – Lodz, Poland". staypoland.com. eTravel S.A.
^ Madejska, Marta (2 November 2017). "Uniwersytet dla robotniczej Łodzi". Retrieved 27 October 2018. ^ Cysek-Pawlak, Monika; Krzysztofik, Sylwia (2017). "Integrated Approach as a Means of Leading the Degraded Post-Industrial Areas Out of Crisis - A Case Study of Lodz". IOP Conference Series: Materials Science and Engineering. 245: 1–8. doi:10.1088/1757-899X/245/8/082036. eISSN 1757-899X. ISSN 1757-8981. Retrieved 6 November 2017. ^ "Neues Leben in alten Fabriken: Lódz baut auf Kultur" (in German). Weser Kurier. 22 September 2009. Archived from the original on 23 July 2011. Retrieved 2 October 2009. ^ "Foundation For Saving Karol Scheibler's Chapel". Scheibler.org.pl. Archived from the original on 11 January 2010. Retrieved 25 January 2010. ^ "Russia: Principal Towns". Statesman's Year-Book. London: Macmillan and Co. 1898. p. 863. ^ Gilbert, Martin (1994). The First World War: A Complete History. New York: Henry Holt and Company. p. 107. ISBN 080501540X. ^ a b Jennifer Rosenberg (1998). "The Łódź Ghetto". Jewish Virtual Library. Retrieved 29 July 2011. ^ a b c Jennifer Rosenberg (2015) . "The Lódz Ghetto (1939–1945)" (Reprinted with permission). History & Overview. Jewish Virtual Library. Retrieved 19 March 2015. ^ a b c d Jennifer Rosenberg (2006). "The Łódź Ghetto". Part 1 of 2. 20th Century History, About.com. Archived from the original (Internet Archive) on 30 April 2006. Retrieved 19 March 2015. Lodz Ghetto: Inside a Community Under Siege by Adelson, Alan and Robert Lapides (ed. ), New York, 1989; The Documents of the Łódź Ghetto: An Inventory of the Nachman Zonabend Collection by Web, Marek (ed. ), New York, 1988; The Holocaust: The Fate of European Jewry by Yahil, Leni, New York, 1991. ^ a b c d The statistical data, compiled on the basis of "Glossary of 2,077 Jewish towns in Poland" Archived 8 February 2016 at the Wayback Machine by Virtual Shtetl, Museum of the History of the Polish Jews, as well as "Getta Żydowskie" by Gedeon (in Polish) and "Ghetto List" by Michael Peters (in English). Accessed 25 March 2015. ^ a b c d Abraham J. Peck (1997). "The Agony of the Łódź Ghetto, 1941–1944". The Chronicle of the Łódź Ghetto, 1941–1944 by Lucjan Dobroszycki, and The United States Holocaust Memorial Museum, Washington D.C. The Simon Wiesenthal Center. Retrieved 25 March 2015. ^ Golden, Juliet (2006). "Remembering Chelmno". In Vitelli, Karen D.; Colwell-Chanthaphonh, Chip (eds.). Archeological Ethics (2nd ed.). AltaMira Press. p. 189. ISBN 075910963X. Retrieved 25 March 2015. ^ JVL (2013). "Chelmno (Kulmhof)". The Forgotten Camps. Jewish Virtual Library.org. Retrieved 25 March 2015. ^ S.J., H.E.A.R.T (2007). "Chronicle: 1940 – 1944". The Łódź Ghetto. Holocaust Research Project.org. Retrieved 22 March 2015. ^ Archives (2015). "Polish Righteous". Łódź. POLIN Museum of the History of Polish Jews. Retrieved 25 March 2015. ^ Ash, Timothy Garton (1 January 1999). "The Polish Revolution: Solidarity". Yale University Press – via Google Books. ^ Kenney, Padraic (1997). Rebuilding Poland: Workers and Communists 1945-1950. Ithaca: Cornell University Press. p. 342. ISBN 0-8014-3287-1. ^ a b Obraniak, Włodzimierz (2007). Ludność Łodzi i innych wielkich miast w Polsce w latach 1984-2006 (PDF). Łódź: Urząd Statystyczny w Łodzi. p. 5. Retrieved 27 July 2017. ^ weatheronline.pl. "klimat – wykres – Łódź Polska – WeatherOnline". weatheronline.pl. ^ a b c d Cudny, Waldemar (2012). "Socio-Economic Changes in Lodz – The Result of Twenty Years of System Transformation" (PDF). Geografický časopis (Geographical Journal). 64 (1): 3–27. ISSN 1335-1257. Retrieved 25 November 2017. (pp. 11–12). ^ a b Szukalski, Piotr; Martinez-Fernandez, Cristina; Weyman, Tamara (2013). "Lódzkie Region: Demographic Challenges Within an Ideal Location". OECD Local Economic and Employment Development (LEED) Working Papers (05/2013): 1–56. doi:10.1787/5k4818gt720p-en. eISSN 2079-4797. Retrieved 25 November 2017. (p. 7). ^ a b Gołata, Elżbieta; Kuropka, Ireneusz (2016). "Large cities in Poland in face of demographic changes". Bulletin of Geography. Socio–Economic Series. 34: 17–31. doi:10.1515/bog-2016-0032. ISSN 1732-4254. Retrieved 25 November 2017. (p. 21). ^ Cox, Wendell (2014). "International Shrinking Cities: Analysis, Classification, and Prospects". In Richardson, Harry W.; Nam, Chang Woon (eds.). Shrinking Cities: A Global Perspective. London and New York: Routledge. pp. 11–27. ISBN 978-0415643962. (p.14). ^ Holm, Andrej; Marcińczak, Szymon; Ogrodowczyk, Agnieszka (2015). "New-Build Gentrification in the Post-Socialist City: Łódź and Leipzig Two Decades After Socialism" (PDF). Geografie. 120 (2): 164–187. ISSN 1212-0014. Retrieved 25 November 2017. (pp. 169–170). ^ “Piotrkowska Street Stroll.” Poland's Official Travel Website. Retrieved 18 July 2017. ^ Krakowiak, Beata (2015). "Museums in Łódź as an Element of Tourism Space and the Connection Between Museums and the City's Tourism Image". Tourism. 25 (2): 87–96. doi:10.1515/tour-2015-0008. eISSN 2080-6922. ISSN 0867-5856. Retrieved 18 July 2017. (p. 93). ^ a b Kaczmarek, Sylwia; Marcinczak, Szymon (2013). "The Blessing in Disguise: Urban Regeneration in Poland in a Neo-Liberal Milieu". In Leary, Michael E.; McCarthy, John (eds.). The Routledge Companion to Urban Regeneration. Routledge. pp. 98–106. ISBN 978-0-415-53904-3. (p. 103). ^ a b Strumiłło, Krystyna (2016). "Adaptive Reuse of Buildings as an Important Factor of Sustainable Development". In Charytonowicz, Jerzy (ed.). Advances in Human Factors and Sustainable Infrastructure. Springer. pp. 51–59. ISBN 978-3-319-41940-4. (p. 56). ^ a b c Długoński, Andrzej; Szumański, Marek (2015). "Analysis of Green Infrastructure in Lodz, Poland". Journal of Urban Planning and Development. 141 (3): n. pag. doi:10.1061/(ASCE)UP.1943-5444.0000242. eISSN 1943-5444. ISSN 0733-9488. Article first published online in 2014. ^ Grzegorczyk, Arkadiusz, ed. (2015). Ilustrowana Encyklopedia Historii Łodzi. Łódź. pp. 59–61. ISBN 978-83-939822-0-2. ^ "Jewish Lodz Cemetery - About Cemetery At Bracka Street". Retrieved 25 January 2017. ^ "The New Cemetery in Łódź". Lodz ShtetLinks. Retrieved 12 January 2013. ^ "JEWISH CEMETERY". FUNDACJA MONUMENTUM IUDAICUM LODZENSE. Retrieved 12 January 2013. ^ Kobojek, Elżbieta (2017). "A Small River Within the Urban Space: the Evolution of the Relationship Using the Example of Łódź" (PDF). Space-Society-Economy. 19: 7–20. doi:10.18778/1733-3180.19.01. ISSN 1733-3180. Retrieved 13 July 2018. (p. 10). ^ Lamprecht, Mariusz (2014). "Fluctuations in the Development of Cities. A Case Study of Lodz". Studia Regionalia. 38: 77–91. ISSN 0860-3375. Retrieved 13 July 2018. (p. 82). ^ "Pociągi Łódź – Warszawa - GoEuro". www.goeuro.pl. Retrieved 14 February 2018. ^ a b c (AFP)–24 Jan 2009 (24 January 2009). "AFP: Dell seeks refuge in Poland as crisis bites". Google.com. Archived from the original on 25 May 2012. Retrieved 11 April 2010. ^ Wiśniewski, Szymon (2017). "Łódź in the Regional and National Transportation System" (PDF). Space-Society-Economy. 19: 65–86. doi:10.18778/1733-3180.19.04. ISSN 1733-3180. Retrieved 17 July 2018. p. 66. ^ Shepard, Wade (10 November 2016). "Europe Finally Wakes Up To The New Silk Road, And This Could Be Big". Forbes. Retrieved 22 July 2018. ^ Bentyn, Zbigniew (2016). "Poland as a Regional Logistic Hub Serving the Development of the Northern Corridor of the New Silk Route". Journal of Management, Marketing and Logistics. 3 (2): 135–44. ISSN 2148-6670. Retrieved 20 July 2018. (p. 142). ^ www.lifemotion.pl. "Our destinations – Port Lotniczy Łódź im. Władysława Reymonta". lodz.pl. ^ "About MPK – MPK-Lodz Spolka z o.o." lodz.pl. ^ "Łódź railway tunnel tender announced". RailwayPro. 6 December 2016. Retrieved 3 August 2017. ^ a b "Superdworzec już jest, będzie (prawie) metro. Łódź ma być komunikacyjnym centrum kraju". TVN24. 2 December 2016. Retrieved 3 August 2017. ^ a b "Łódź będzie miała 'metro'. I to już niedługo". Wyborcza.pl: Magazyn Łódź. 18 May 2016. Retrieved 3 August 2017. ^ Rogaczewska, Beata (1 November 2016). "Łódź Fabryczna: największy podziemny dworzec kolejowy w Polsce i trzeci w Europie". rp.pl. Retrieved 3 August 2017. ^ "The New Centre of Łódź has a Local Action Plan – URBACT". urbact.eu. ^ "Rekordowy rok Łódzkiej Kolei Aglomeracyjnej". kurierkolejowy.eu. 22 December 2016. Retrieved 3 August 2017. ^ Dana, Przemek (16 January 2015). "Janusz Morgenstern, reżyser m.in. "Stawki większej niż życie" nie żyje". Retrieved 14 February 2018. ^ Pavitt, Michael (13 April 2018). "Poland and Hungary awarded upcoming editions of European Universities Games". insidethegames.biz. Retrieved 14 April 2018. ^ "Szkoła Mistrzostwa Sportowego im. K. Górskiego w Łodzi – Oficjalna strona internetowa Szkoły Mistrzostwa Sportowego w Łodzi". smslodz.pl. ^ "Spółdzielczy Klub Sportowy START Łódź ul. św. Teresy 56/58 – Oficjalny serwis". sksstart.com. (in English and Polish) copyright 2007 UMŁ. 2007. Retrieved 23 October 2008. ^ "Chemnitz". Urząd Miasta Łodzi (in Polish). Retrieved 14 December 2018. ^ "Partner Cities of Lyon and Greater Lyon". [[copyright|]] 2008 Mairie de Lyon. 2008. Archived from the original on 19 July 2009. Retrieved 21 October 2008. ^ "Wilno". Urząd Miasta Łodzi (in Polish). Retrieved 14 December 2018. ^ "Kaliningrad -Partner Cities". [[copyright|]] 2000–2006 Kaliningrad City Hall. 2000. Archived from the original on 22 April 2009. Retrieved 8 December 2008. ^ "Odessa". Urząd Miasta Łodzi (in Polish). Retrieved 14 December 2018. ^ "Tel Aviv sister cities" (in Hebrew). Tel Aviv-Yafo Municipality. Archived from the original on 14 February 2009. Retrieved 19 January 2008. ^ "Tjanjin". Urząd Miasta Łodzi (in Polish). Retrieved 14 December 2018. ^ "Rustawi". Urząd Miasta Łodzi (in Polish). Retrieved 14 December 2018. ^ "Barreiro". Urząd Miasta Łodzi (in Polish). Retrieved 14 December 2018. ^ "Tampere". Urząd Miasta Łodzi (in Polish). Retrieved 14 December 2018. ^ "Puebla". Urząd Miasta Łodzi (in Polish). Retrieved 14 December 2018. ^ "Murcia". Urząd Miasta Łodzi (in Polish). Retrieved 14 December 2018. ^ "Lwów". Urząd Miasta Łodzi (in Polish). Retrieved 14 December 2018. ^ "Szeged". Urząd Miasta Łodzi (in Polish). Retrieved 14 December 2018. ^ "Max Factor - Lodz". Retrieved 25 January 2017. ^ Holocaust chronicles... – Google Books. Books.google.com. May 1999. ISBN 978-0-88125-630-7. Retrieved 25 January 2010. ^ admin. "Jack Tramiel, founder of Commodore computers, Lodz survivor, dies at 83 - j. the Jewish news weekly of Northern California". Retrieved 25 January 2017. Trunk, Isaiah; Shapiro, Robert Moses (2006). Łódź Ghetto: a history. Indiana University Press, Bloomington, Indiana. ISBN 978-0-253-34755-8. Retrieved 6 March 2010. Wikimedia Commons has media related to Łódź.